During swimming sessions we work to improve the freestyle stroke through drills and work on technique. Although other strokes are sometimes included during warm up or for specific training objectives, the main focus is on freestyle as this is the stroke used during competitions. As both juniors and adults improve, more time is spent building appropriate speed, strength and endurance in readiness for competition. Timed swims over the appropriate race distance are undertaken every few months in order to monitor progress. 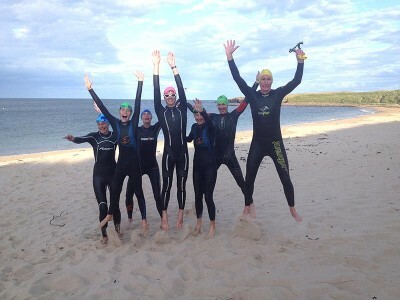 Open water sessions focus on acclimatising to the different conditions prevalent in open water (cold, current, mud etc.) and specific techniques for this kind of swimming (sighting, group swimming in close quarters, deep water starts etc). Juniors usually spend no longer than 20 minutes in the water during open water swimming.